And the words are gently falling." The Tango has been a favorite Finnish music and dance for most of the 20th Century, and every year a Tango Queen and King are chosen in competition, and Finland has a National Tango called Satumaa. This phenomenon is unique in the Scandinavian countries, possibly due to the Finns' love of romantic music. Finnish music often concerns the beauty of their country or the lost mythical land of Karelia. There was a revival of tango music in the 1950's and 60's, and when rock music came along, Finland became more or less divided between Tango (and Humppa, a kind of two-step) in the north and rock in the south. This line went from roughly Vaasa to Kouvola. There are hundreds of music and song festivals throughout Finland in the summer that attract musicians and visitors from all over the world. No matter what type of music is your interest, you will find a concert somewhere in Finland, especially in the summer. Historical music mp3's: Metsäkukkia and Valssi menneiltä Ajoilta by Viljo Vesterinen, and Lasse Pihlajamaa, 1950. 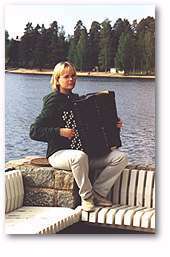 Karelian Music today is played on both sides of the border with Russian Karelia. Similar instruments in pre-WWII Karelia - northeast Ladoga area. Oldies, and lots of them! Yes!